A while back I took a look at the Spyderco Sage 2. The Sage 2 is an absolutely fantastic knife and with it’s eye catching titanium handle, I find that the Sage 1 often plays second fiddle. That is a shame, because I think that the Sage 1 may be the better EDC knife – at least for me. Regardless, I can safely say that it’s an excellent EDC knife. Clearly, it’s high time I reviewed my Sage 1. Let’s take a closer look and see why I like this knife so much. The Sage 1 is arguably the perfect EDC knife for my purposes. Yes, you read that right. The Sage 1 is my personal EDC blade, and for my purposes I couldn’t ask for a better knife. What I like about the Sage 1 is that it has perfect EDC proportions, excellent materials, outstanding fit and finish and it carries very well. In addition to EDC, I think this knife is a great collector’s piece (I know plenty of people who have all 3 of the knives in the Sage series) and while the Sage 1 is not billed as a tactical knife, it could certainly fulfill an emergency tactical role. Finally, the carbon fiber and stealthy carry make this a great option for a gentleman’s folder. As for the dimensions we have a 3″ blade, an overall length of 7 1/8″ and a weight of 3.2 ounces. Going back to me calling the Sage 1 the “perfect” EDC knife, the dimensions of the Sage 1 are ideal for EDC in my book. I really don’t like carrying anything smaller, and anything bigger starts to raise some eyebrows (sad, but true). The Sage 2 actually handles like a bigger knife, but it remains small and is people friendly. The blade is a classic Spyderco leaf shape given a nice full flat grind. There is a decent amount of belly and the tip has a sturdy point while still being strong. This is a very practical blade shape that is also non-threatening to people who don’t understand knives. The blade steel is S30V which was a gold standard for production knives for many years. When I originally wrote this review in 2011, it was about as good as you would find in any $100 knife. It’s still a great choice, but I would not complaint if they upgraded to S35VN, or chose CTS-XHP like on the Chaparral. S30V is a harder steel, so sharpening takes more effort than say, AUS8 and other more inexpensive steels. However, S30V it takes a good edge and holds it well. S30V is also very resistant to rust and corrosion. Given the price point and intended use of the knife I think this is a great steel. The handle is part of what sets each Sage apart, and the Sage 1 has carbon fiber scales over stainless steel liners. The carbon fiber is left with a “woven” or “twill” texture that provides some traction and is pleasant in hand. The entire knife is held together by 3 hex bolts, and the flow through design is an exercise in restraint. Looking inside you can see that the liners have been milled out extensively. I count no less than 4 different size bits used to mill this liner out. Everything has been expertly finished and polished up – including the liners. The ergonomics are another huge plus to the Sage 1 (and the entire Sage series really). First of all, there is a nice 50/50 choil and a large thumb ramp. This makes the most of the relatively small handle and provides plenty of room, even for larger hands, in practically any grip. I absolutely love the ergonomics of the Sage, it’s much like the Caly 3 if you have ever handled one of them. Basically it gives you a big knife grip in a small easy to carry package. The pocket clip is another home run. While pocket clips are often a source of grief for me the Sage 1’s clip is about to close to perfect as I can ask for. The Sages all use the Spyderco “wire” clip, which is actually a very strong piece of tempered steel. What sets the Sage 1 apart is that has given the clip a black coating. Not only has the coating held up extremely well, the knife disappears when you clip it to the pocket. If you work in an office, this is the perfect knife – it’s very difficult to notice this knife when wearing slacks (ultimate urban camo). Finally, I have to mention that Spyderco gives you the option for ambidextrous tip up carry. This is perfect for my applications. The Sage 1 uses a liner lock, and not just any liner lock but a “Walker Linerlock.” That is because the Sage series was designed to pay homage to innovators in the knife industry and the Sage 1 was made to honor Michael Walker. Michael Walker is known for designing the ball-bearing detent method of holding a lock in place which is used in many many knives today. A knife designed around a lock should have decent lockup, and the Sage 1 does not disappoint. The lock makes a very crisp “click” when engaged and it bites in nice and early. There is absolutely zero play in any direction. This is a very strong liner lock worthy of paying homage to Michael Walker. Deployment is accomplished by a 1/2″ Spyderhole. I found deployment to initially be pretty stiff on the Sage 1. For a while this was my only real complaint with the knife. However, it took a while but the knife slowly broke in. These days deployment is very smooth and it only seems to be getting smoother (after months of carry). Of course there are some large phosphor bronze washers in there which reduces the friction but the tolerances are very tight on this knife – in my experience this knife will take time to break in but is well worth the wait. Ah, the age old question. Two beautiful Spyderco knives that are very similar in size, price and materials yet have some interesting differences as well. Which one should you choose? Well, I attempted to answer that question with a youtube video. It’s not an easy answer, but I like the idea of saying “the Sage 1 is my wife and the Caly 3 is my mistress.” Really that Caly 3 is built like nothing else, just an awesome knife that has the “soul” I think the Sage 1 lacks in some way (difficult to describe). That said, for all out practical EDC use, I prefer the Sage 1. The knife rocks, it’s designed to be used and will be up for any challenge. Buy ’em both if you have the money, I don’t think you will be disappointed with either one. So yeah, what is there left to say? Not a whole lot really, the Sage 1 is just a fantastic knife. I stand by my original comment that this is the “perfect EDC knife” for me – even months after writing the first draft of this review – this one’s a keeper! Sure it all comes down to personal preference, but I’ve handled a lot of knives and if you are looking in the ~3″ blade EDC knife category, it’s going to be hard to find something as well rounded and beautifully executed as the Sage 1. I tell you, I write very few reviews that are this positive, I literally have nothing bad to say about the Sage 1. The overall fit and finish on this knife is outstanding. Every surface has been polished, the blade centering is dead on, and everything has been done to an almost eerie state of perfection. If you are on the fence about the Sage 1 my advice would be to go ahead and buy it. You will not be disappointed. Update – I originally wrote this review in 2011. I still have my Sage 1, still carry it, still use it, and still enjoy it. It remains one of my all time favorite EDC pieces. This continues to be an excellent knife. I recommend purchasing the Sage 1 at Amazon or BladeHQ. Purchasing anything through any of the links on this site helps support BladeReviews. Any and all support is greatly appreciated. Thank you very much. I really like the Spyderco “leaf” profile blades. I find it to be extremely versatile. I will always regret selling my 2 Temperance folders. Matt, I am quite fond of this blade shape as well, especially with a full flat grind. It makes for an amazing slicer, and it’s a beautiful design too. great review!! I really think the Sage I is a perfect EDC carry and I love the texture of the twill carbon fiber handles. Thanks for using my photos for your review, I think they are a good fit with your great review!! Ian, thanks so much for the comment, and letting me use your pictures! Your pictures make the review so much better – thanks again! great review. detailed and well done! i love to get a caly3 with g-10 or other plastic handle, but too bad spderco only produces the carbon fibre now… not a fan of carbon fibre at all. Hey Jay, Not a fan of carbon fiber eh? Can’t say I hear that one all the time but it would be nice to have your choice of handle materials. I believe Spyderco is making a Caly 3.5 now in G10 (a sprint run at least). Its a little bigger than the Caly 3, but it may still fit your needs. Thanks for stopping by and leaving a comment – glad you enjoyed the review. I am surprised to be saying this, Dan: I recently picked up a Sage 1 and am actually disappointed with its cutting ability. I could not agree more with you about the superb fit and finish. Everything from the carbon fiber scales to the liners to the clip to the (smooth, exquisitely precise) lock is just wonderful for a production knife. EXCEPT … I think the edge grind is mediocre. It is pretty asymmetrical when you look at each side of the knife. The blade does not cut well, even with some sharpening on my part, and when it does cut it deviates from a straight line. I struggled to cut up a thick cardboard box with the Sage 1. When I tried some food prep, it dragged and tore the same basil leaves that my Dragonfly effortlessly and cleanly chiffonaded. Very surprising to me because I had recently picked up a Spyderco Paramilitary 2 which is an AWESOME cutting instrument. Same company, same blade steel. What I conclude is that Spyderco’s Taiwanese factory does not quite have its act together on blade grinding to the same extent as the Golden factory or especially the good old reliable Seki City folks. My Japanese VG-10 flat ground Spyderco blades are all clearly superior performers to this Sage 1. Not only the Dragonfly, Endura, etc. … even my Ladybug 3 is doing a better job at EDC and food prep tasks! I will have to undertake to reprofile the Sage; maybe that will bring it up to par. I am sorry to hear that! My Sage 1 has been sharpened so many times it barely resembles it’s original form so it’s tough for me to determine whether your edge is the exception or the rule. You might be right, the Taiwanese factor might have missed the mark here with the edge application, although I have been pleased with how mine has cut over the months. I will have to take a closer look at my friend’s Sage 1, who just purchased it a few weeks ago – I think it still has the original edge. Thanks for the heads up and again, sorry to hear yours isn’t cutting that well. I agree, sounds like a re-profile is in order. I have had my Sage 1 for a little over a week now and I love this knife!! The carbon fiber handle makes it so light throughout the day i forget it’s even in my back pocket. And the blade! I have cut through boxes, rope, and plastic containers at work and it cut like butter. Amazing knife. I will be carrying this for a long time as my primary EDC knife. Thanks for your review, it’s what took me off the edge to buy the knife. Through your link, of course. Keep up the good work. Thanks Brandon! I am glad the sage worked out for you. It’s one of my all time favorites (which explains the rather glowing review). Thanks for taking the time to follow up, and thanks for supporting the site. Always appreciated! Hey! AWESOME reviews! I love my sage 1, and I can’t agree more with your analysis , keep up the great work!! Dan, I want to first thank your for your website. Your reviews rock. Keep it up. I am wanting to purchase my first “real” knife. I am looking at an EDC and tactical combo. I am torn between the Sage 1 and the PM2. I like the weight of the Sage 1 for pocket carry. It seems more of a gentleman’s knife in that respect. Its a little shorter than the PM2. Other pluses include the carbon fiber handle and wire pocket clip. The plus, maybe incorrectly, is the blade length of the PM2. Tactically speaking, am I fooling myself over less than 1/2 “? Both are about the same price and the Sage1 is readily available. The PM2 is on back order. To toss in another consideration, I have a good friend who is much more into knives than I am, thinks both are too big and recommends the Kershaw Scallion. I like that knife but I have tactical reservations re the 2 1/4” blade. I would appreciate your advise. Thanks in advance. You are very welcome! I am so happy to hear you have been enjoying the reviews. First of all, I am not a martial artist or self defense expert by any means, so this is a question best answered by someone else. That said, in my opinion, if you are comparing the Sage 1 and Paramilitary 2 for self defense use, I would suggest the PM2. It’s a larger knife, better suited for that kind of use. Not only do you get a bigger blade, but the handle is much bigger. I’ve owned the Chaparral for a few weeks now. I love it so much I went and ordered its big brother, the Sage-1. I should have it sometime next week. I can’t wait. Your review has been like most of the rests, really favoring the Sage-1. The favorable review is for good reason; it’s an awesome knife. Congrats on the purchase and enjoy it when it arrives. You are in for a treat. 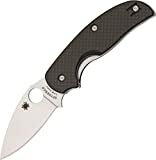 I have been all over the web and I am trying to decide whether to go with the benchmade 940, of the spyderco Sage-1. I have never bought a knife over $ 100; however, I am an Eagle Scout with many years of knife experience. I am looking for a good EDC knife that would be a good companion in the woods as well. I like the more traditional look of the 940 but also am open to something new if the sage is a all around better knife. Having used both, do you have any thoughts or advice? Thanks for stopping by. I think both are excellent EDC knives and should be fine for light use in the woods as well. I have both and enjoy them both. If you are undecided between the two my suggestion would be to try and check them out in person in a local knife or outdoor store. After only having played with it for a few hours now, I can tell you that the Sage 1 is absolutely going to be one of the starters in my EDC rotation. We will see on Wednesday how the Mini Grip stacks up! Congrats on the new blades. You picked out a couple of my all time favorites there, and I hope you enjoy them. Please let me know what you think of the Mini Grip when it arrives. With the new, compression lock equipped Sage 5 coming out do you think the Sage 1 will finally be unhorsed as your favorite EDC? I saw it in a video for the 2016 SHOT Show and thought of your blog immediately. Thanks for thinking of the blog. The Sage 5 may very well unhorse the Sage 1 – I always liked how the compression lock kept your fingers out of the path of the blade when closing, so who knows. I’ll definitely be picking one up for review. Why did I wait so long to buy this knife ? . As usual, your review covered the knife well. The perfect EDC is dead on..The Sage 1 doesn’t have the wow factor like a PM2 etc. However, it is subtle perfection..Anyone who uses/collects knives should get this knife. I’ve handled and owned many knives and this is one of the best. I have several PM2s with the compression lock. I like the lock however, I think the liner lock is a good fit for this knife. I’ve read scores of reviews/comments on this knife. Many say their knife came with good, early lockup and hasn’t moved with use and time. Spyderco really did the liner lock right on this knife. I’m 6ft4 and 270lbs. I get more of a 3 and a half finger grip not choked up. I’ve had to put up with being uncomfortable with many things due to my size. The knife is still comfortable for me. A 1/6 th of an inch longer handle would be great but not a big deal. Mine also needed some break in time. It came stiff (blade opening/closing). I thought I had a rare lemon. It got better in a couple of weeks. In a couple of months now, it’s buttery smooth. The lockup is early and perfect. The knife is so good, I bought two. The second one was smooth out of the box. Welcome to the Sage 1 club – I don’t find too many dissatisfied with this knife. Although the Para 2 is often regarded as the best Spyderco, I find this Sage 1 tough to beat. I do like the ability to use the compression lock without putting your fingers in the way of the blade, but there is something tremendously satisfying about this knife. It’s built a little better than the Para 2, so perhaps that is it. At any rate, I am glad you are enjoying your Sage 1s. Thank you for stopping by to tell us a little about your experience with them.